Improved sales support through updated website. 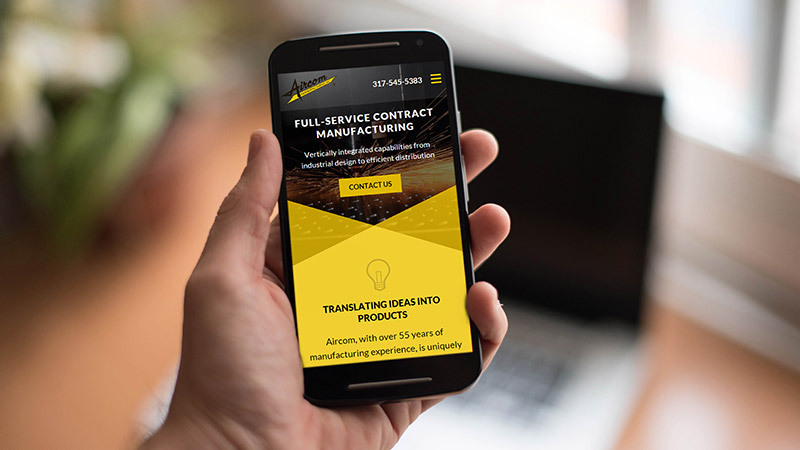 Aircom Manufacturing and its subsidiary, Medivative Technologies, knew that their customers and prospects were using the Internet more and more often when researching contract manufacturing partners. “You can hear them typing on the keyboard as soon as you introduce yourself and the company.” noted one of the sales directors in our project kick off meeting. The employees of both companies agreed, the websites were outdated and did a poor job reflecting their capabilities. Our research into audience personas confirmed what the people at Aircom were experiencing. Their target market overwhelmingly said that Aircom and Medivative could do so much more than was represented on their website. All audience segments wanted to see more about manufacturing capabilities and experience. 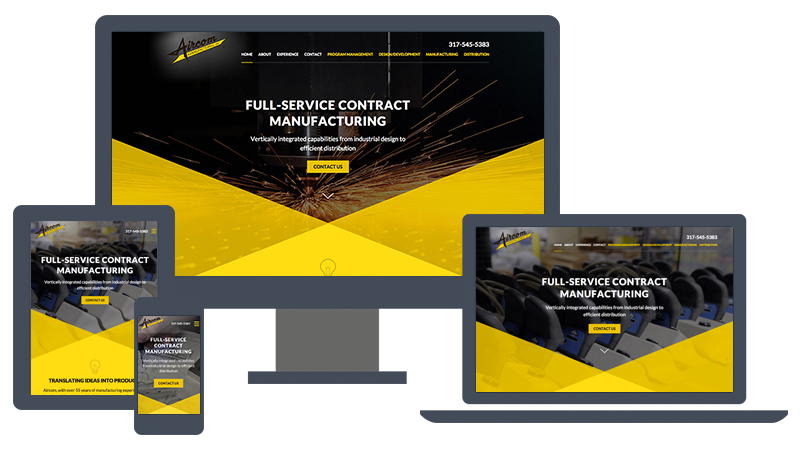 Aircom needed more than a simple redesign, they needed a website that could be part of their sales kit. 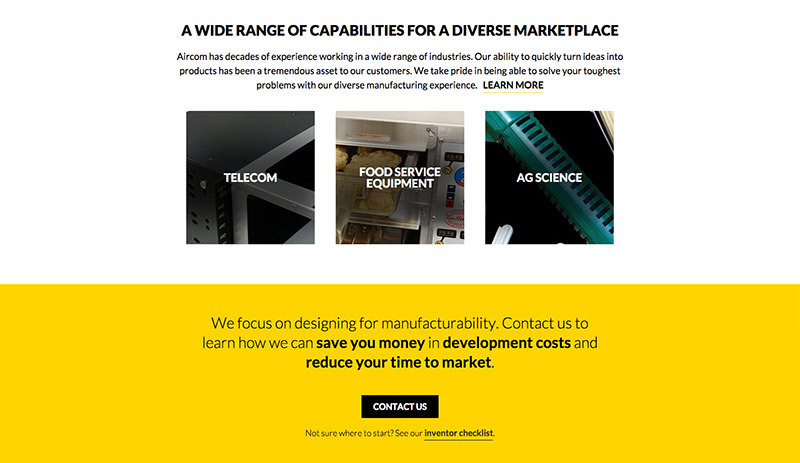 A website that would promote their services and explain their strengths. 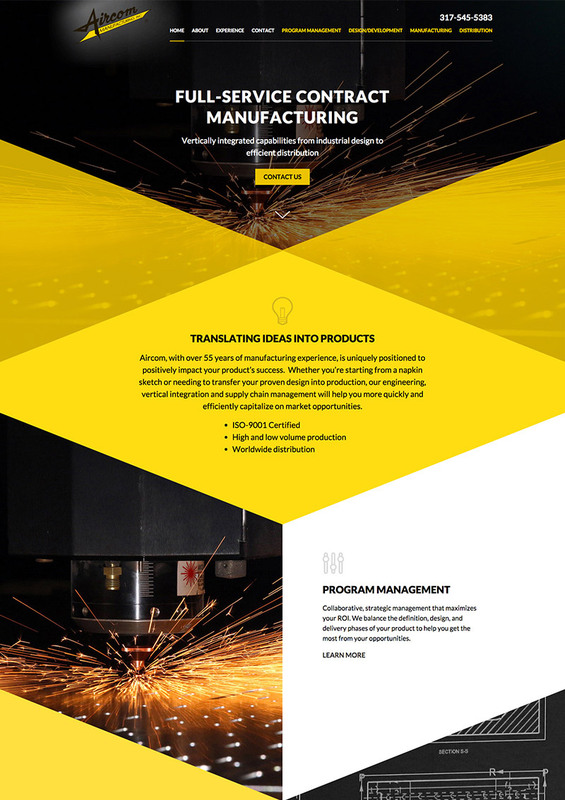 Emphasis on manufacturing process: Through both design and content, the new websites clearly illustrate that Aircom can work with companies through the entire manufacturing process from design to distribution. The menu highlights the process in a different way than the other menu items. The home page walks the user through each step in the manufacturing process sequentially. Each process page follows a similar design and content format with calls to action leading to the next step in the process. Stronger calls to action: The new site makes it easier for prospects to reach out to Aircom with strong directives and calls to action throughout. We also added a new “inventor checklist” to help people qualify themselves before contacting Aircom. Expanded experience information: One of our top content goals was to better communicate the experience and capabilities of Aircom and Medivative. We added a section that focuses on their experience and includes mini-case studies to illustrate precisely what each can do for their clients. We also incorporated a visual block of content that displays their capabilities across industries. From the detail in the original proposal to project tracking and finally launch, TBH was very thorough, professional and easy to work with. Our business is pretty complicated and hard for those not in our industry to understand. Having said that, TBH picked up what we wanted to communicate very quickly. The final product not only met but exceeded our expectations. Every website is more successful when it is monitored and adjusted to continually meet its audience needs. TBH Creative has 'phase 2' ideas for Aircom to further expand their website and digital marketing impact. Project strategist, Tatum Hindman says, "We hope to work with the Aircom team to expand the presentation of their wide range of experience with full case studies, add more videos, and increase lead traffic and lead conversions from the new website." Aircom Manufacturing is a contract manufacturing company that handles design, development, manufacturing and distribution. Aircom works in a variety of industries including telecommunications, animal health care, food services, agricultural and automotive. Medivative Technologies, a wholly owned subsidiary of Aircom Manufacturing, is a contract manufacturing company focused on the medical device industry.